The Lab is a not-for-profit place where people can experiment and be experimented on in service of enlivening human beings. It is a safe haven for creative expression and failing happy. Born in 2015, it has evolved through a number of forms and, a bit like the legend of the phoenix, each time a format begins to get stale and repetitive, it dies and is reborn. The current format has a very minimal structure – People (whoever attends) + Place (a space) + Purpose (Lab Manifesto). The content is discovered live between those who attend. Whoever shows up is whoever was meant to show up. You can come along to try something out or come along to take part in the experiments. You can come along and bring an experiment you have already thought of or you might discover an experiment ‘live’. There are three simple rules for Lab experiments: 1) I have never tried it before, 2) I have no idea if it is going to work or not, 3) It is in service of enlivening human beings. 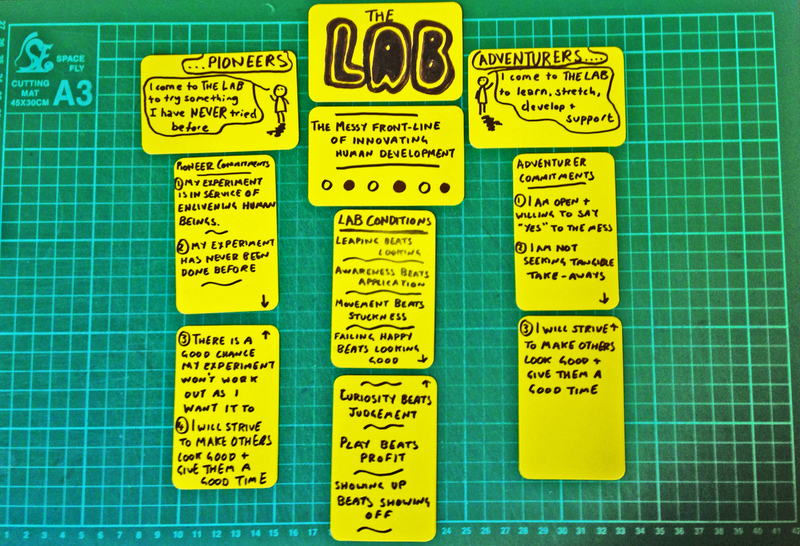 Read about what has happened at every Lab since 2015 in “Lab Notes” below. Lab Notes is the official newsletter of the Lab and contains photos and write-ups of every experiment that has taken place. It also sends out the latest dates for future Labs. * The Lab is not-for-profit due to the belief that the transaction of cash for services has a detrImental impact on the nature of pure ‘fail happy’ experimentation. The Lab fee of goes to cover venue hire, materials, PR and any surplus goes into reserves, REFERRED TO AS “THE LAB FOUNDATION.” THESE FUNDS ARE USED TO PAY for future Lab activities, subsidise future Labs that may not have enough attendees OR TO PAY FOR A PLACE FOR those who wish to attend but do not have the financial means to do so. The accounts for the Lab AND THE LAB FOUNDATION are available on request. Pingback:Fertile vs. Fruitful – Does cash stifle creative experimentation? | Can Scorpions Smoke?